On 24 June 1532 (or, possibly, 1533) Lady Jane Dudley, the wife of Sir John Dudley, gave birth to her fifth son, Robert. It was a holiday with much street celebration in England, the Feast of St. John the Baptist. It may also have been his father’s name day, so that baby Robert was arguably a very special present. Robert was either the fifth or the sixth child of his parents, depending on whether his sister Mary was older or younger than he. His eldest brother, Henry, was about seven in June 1532, while his mother was 23 or 24. Robert was to see the arrival of seven or eight more siblings, the last of which seems to have been born in early 1547, when he was 14. All this he did not write to his wife (“lacking leisure”) but rather to his colleague William Paget; after all, Jane Dudley was now 38 and “only” a viscountess. 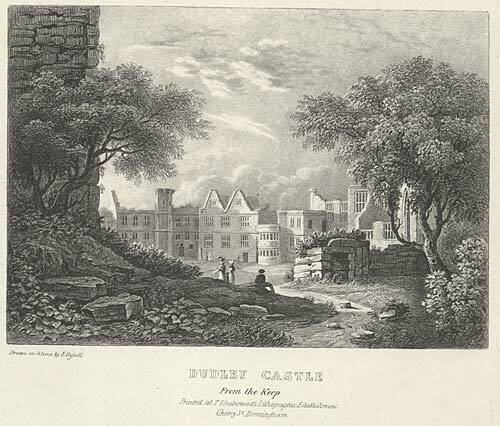 John Dudley’s additions to Dudley Castle, one of Robert Dudley’s childhood homes. 19th century print of the ruins. Sir John also provided for more private quarters: a great chamber and four or five bed chambers located over the large kitchen and bakery, so the family had it always warm! Please it your Lordship; so it is that within two or three days after my coming home to Dudley, Andrew Flamoke and his son came thither to me, and the same night sickened both in a bed in my house, and by the next day at night, the son was dead full of the marks, and the father hath a blain. And no way with him but on as they that keepeth him can conjecture; they came both out of Gloucestershire from Mr. Poyntz, and whether they brought it from thence or by the way, God knoweth, for this country was as clear before their coming as any county in England. If it might please your good Lordship to be so good Lord unto me to be a mean for me to the King’s highness for the office of Kenilworth, I were much bound to your Lordship, if not, your Lordship may do your pleasure for any other that you shall think meeter for it, for no man hath knowledge hereof by me but your Lordship. And sorry I am (as knoweth God) to send you word of such news, for the King’s highness shall lose a tall man of him. His son died this last night, and he himself both raveth and hath the blain. No more to your Lordship at this time, but the merciful Lord have you in his merciful keeping, and all yours. with the rude hand of your most bounden through life. The elder Flamock survived his illness and died in battle against Kett’s rebels in 1549, fighting alongside his comrade John Dudley. Following this, Dudley begged Protector Somerset to grant the keepership of Kenilworth to his son Ambrose, Robert’s elder brother. The protector did not comply – alas, before long he was ousted from power and Ambrose had his keepership. To become the perfect courtier Robert had, of course, to spend time from early on at – the court. We do not know when he made his first appearance there, but with the coming of Anne of Cleves it certainly became the chief abode of his parents. John Dudley was appointed Master of the Queen’s Horse, his wife continued as lady-in-waiting, as she had done with some of the earlier queens. Sir John also served Katherine Howard as Master of the Horse. About this time Robert must have met the Lady Elizabeth, the king’s daughter, “for they had first become friends before she was eight years old”,11 as he recalled many years later. Their favourite topic of conversation was marriage. In Henry VIII’s next wife, Katherine Parr, the Dudleys had a particular friend in power, and during these years Robert, now the son of the Lord Admiral, may have become a companion of Prince Edward. He probably was allowed to share some of the prince’s lessons and certainly made a number of lifelong friends among his “schoolfellows”: Henry Sidney and Barnaby Fitzpatrick, but also the future earls of Pembroke and Derby, Henry Herbert and Henry Stanley. Adams, Simon (2008): ‟Dudley, Robert, earl of Leicester (1532/3–1588)“. Oxford Dictionary of National Biography. Online edition. Beer, B. L. (1973): Northumberland: The Political Career of John Dudley, Earl of Warwick and Duke of Northumberland. The Kent State University Press. Brigden, Susan (2012): Thomas Wyatt: The Heart’s Forest. Faber & Faber. Ives, Eric (2005): The Life and Death of Anne Boleyn: ‘The Most Happy’. Blackwell. Ives, Eric (2009): Lady Jane Grey: A Tudor Mystery. Wiley-Blackwell. Ives, Eric (2012): The Reformation Experience: Living Through the Turbulent 16th Century. Lion Books. Loades, David (1996): John Dudley, Duke of Northumberland 1504–1553. Clarendon Press. Loades, David (2008): ‟Dudley, John, duke of Northumberland (1504–1553)“. Oxford Dictionary of National Biography. Online edition. Loades, David (2013): Catherine Howard: The Adulterous Wife of Henry VIII. Amberley. Porter, Linda (2011): Katherine the Queen: The Remarkable Life of Katherine Parr. Pan. St. Clare Byrne, Muriel (ed.) (1983): The Lisle Letters: An Abridgement. Secker & Warburg. Warnicke, R. M. (2012): Wicked Women of Tudor England: Queens, Aristocrats, Commoners. Palgrave. Wilson, Derek (2005): The Uncrowned Kings of England: The Black History of the Dudleys and the Tudor Throne. Carroll & Graf. This entry was posted in Elizabeth I, family & marriage, Jane Dudley, John Dudley, letters, religion, Robert Dudley and tagged Anne Boleyn, Baron Dudley, Dudley Castle, Henry VIII, jewels. Bookmark the permalink.